Former prime minister Margaret Thatcher divides opinion, so what do people in Grantham think of calls to promote the town’s connection with its most famous daughter? Staff explain that Baroness Thatcher’s old bedroom is used as a hypnotherapy room. “It is sad that there isn’t more to see really,” says Sandra Good, who owns the business. “I think that one day it might be regretted that nothing was done to preserve the building as a museum. “We have so many tourists coming to photograph the building, some brave enough to venture inside. “They come from Japan, they come from Portugal, from America, just from all over the world really. “We had somebody once I thought he was going to kiss the carpet in the room he was so excited. “Some are coach trips, some are passing through. Sometimes we get a little gaggle of Chinese or Japanese tourists outside. Sometimes it’s one or two. Somebody comes every week. Heading towards the town centre, Grantham resident Alan Bywater, 46, is sitting on a bench next to a statue of Sir Isaac Newton, who was born near Grantham. 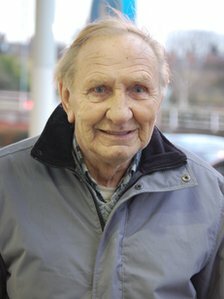 Mr Bywater thinks the town should do more to promote its connection with Baroness Thatcher. “Of course there should be more,” he says. “They have a statue of him who dropped an apple on his head but she’s got nothing, has she? But Mr Bywater’s friend, Yasmine Bougatef, isn’t sure. “I was reading in the paper that she was the one that caused the last recession and everybody losing their jobs, which is what Cameron is doing now,” says the 27-year-old. 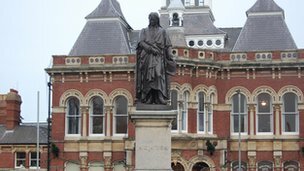 Should Grantham have a statue of Margaret Thatcher, like this one of Sir Isaac Newton? “I don’t believe in that, but she was the first woman prime minister. It must have taken a lot of guts and strength for her in a place dominated by men. “In my experience from talking to her, she always spoke of the town very fondly,” says Mr Allen. Baroness Thatcher’s rise to power is charted in a film due for release on 5 January. Sitting near the Isaac Newton Shopping Centre, Kerry Anne McSheffrey, 18, admits a lot of her school friends don’t know much about Baroness Thatcher. She says: “She went to my school, Kesteven and Grantham Girls’ School. 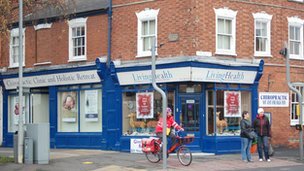 Grantham’s museum, which housed a display of Margaret Thatcher memorabilia, was closed due to spending cuts by Lincolnshire County Council. A charitable trust is expected to reopen the museum in time for the Queen’s Diamond Jubilee in June. Back in North Parade where Baroness Thatcher’s father ran his grocery business, a giant 24-hour supermarket now stands opposite. Graham Metcalfe, 52, says: “Something had to be done. The country was going downhill. Brenda Bell, 53, says: “They could have something like a memorial garden or a statue to her. They’ve got one for Isaac Newton haven’t they?